ICHEON -- South and North Korea are looking to form joint teams in table tennis and swimming at the Asian Para Games next month, Seoul's para sports chief said Wednesday. "We're planning to have a joint Korean teams in table tennis and swimming," said Korea Paralympic Commitee chief Lee Myung-ho. "We've discussed this issue with North Korea. It will be finalized once the Asian Paralympic Committee decides on entries." Lee added that the Koreas also agreed to have a joint parade at the opening ceremony of the 3rd Asian Para Games in Jakarta, which will be held from Oct. 8 to 16. The two sides are also seeking to run Team Korea House together. The two Koreas have yet to compete together in a multisport event for the disabled. The two sides previously planned to have a joint parade at the opening ceremony of the 2018 PyeongChang Winter Paralympic Games but couldn't reach the agreement. South and North Korea had joint teams in women's basketball, rowing and canoeing at the 2018 Asian Games in Indonesia. The two sent a joint women's ice hockey team at the 2018 PyeongChang Winter Olympics. According to the KPC, the two sides discussed the issue during their joint training session in Beijing earlier this month. To boost disabled sports exchanges, the athletes from the South and the North trained together in Beijing from Sept. 3 to 6. For table tennis, the two Koreas are planning to compete together in the doubles and team events. 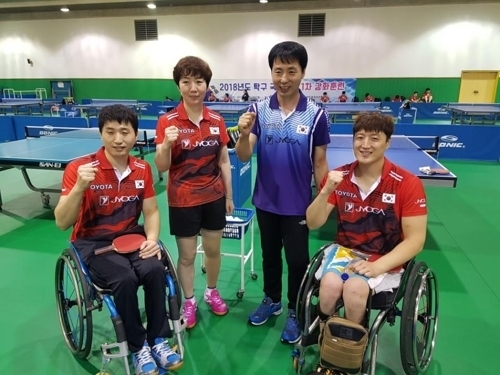 "North Korea will send table tennis players Kim Yong-rok and Pak Kum-jin to the Asian Para Games in Indonesia," South Korea's para table tennis head coach Moon Chang-joo said. "If we form a joint team, the two players will play together with our players." For swimming, the two sides are considering competing in mixed medley relay. The swimmers from the North have yet to be unveiled. However, in order to form joint teams, North Korean athletes first must be classified based on their physical abilities. For instance in table tennis, Kim has no arms, while Pak has poliomyelitis. If they get a different disabled class from South Koreans, forming a joint team may be difficult. South Korean table tennis player Kim Young-gun, who trained together with North Koreans in Beijing, said he has big expectations of playing with North Korean athletes.